Genghis Khan (1162-1227) - Possibly the most fearsome conqueror the world has ever seen. Born Temüjin, he became the Great Khan of the Mongol Empire, conquering virtually everything in his path. By the end of his lifetime he created the largest contiguous land empire on earth, and then his successors made it even larger. He was born in 1162 (probably) in the insignificant region north of China; he would make it significant. Likewise, the Mongolian people had not played much of a role in history until his lifetime. They had been a loose group of nomadic tribes, wandering for centuries, through the steppes of northeast Asia. Temüjin in his native language means "iron", Khan is the Mongolian word for emperor, and Genghis Khan literally means, "Emperor between the Oceans." Little is known about his early years; however, the events which led to his eventual rise are recorded in The Secret History of the Mongols, the oldest surviving source of Mongol history, written by an anonymous author shortly after Genghis Khan's life. His father, Yesügel, was leader of the Borjigin clan, but was killed by the Tatars, enemies of the Mongols, while Temüjin was still young. When he was 14, he killed his half-brother, Behter, which led to his position as his father's successor. About a year later, he was captured and enslaved by a rival clan, the Tayichi'ud. But he escaped and returned home which significantly elevated his reputation among the Borjigin. Apparently as he grew, Temüjin observed that the Mongol tribes seemed incapable of forming anything more than temporary alliances through marriages and friendships. He sought to change that. His first move was to insure his own survival by seeking the protection (some sources say as an ally, some say as a vassal) of his father's anda ("blood brother"), Toghrul of the Kereyid clan. He did so by giving his wife's (Börte) dowry, a sable coat, to Toghrul. Toghrul adopted Temüjin as his son, and backed it up by giving Temüjin 20,000 troops to rescue Börte when she was kidnapped by the Merkid clan. Assisted by Jamukha, who was Temüjin's own "blood brother" (anda), of the Jadaran clan, he set out to retrieve his wife from the Merkids. He not only rescued Börte, he defeated the Merkids as well (not decisively, but he scattered them for years to come). However, the thoroughness with which he exacted retribution was cause for alarm by both Toghrul and Jamukha. Temüjin's strength was growing rapidly and they both took notice. After a series of additional victories over other Mongol tribes (as well as other events), Toghrul and Jamukha turned against Temüjin. But, perhaps due to their previous close relationship, they waited until he had become too powerful. Temüjin shrewdly absorbed defeated tribes (rather than destroy them) into his own, eventually making the Borjigin clan the strongest of all Mongol tribes. Toghrul and Jamukha combined their clans (Kereyid and Jadaran) in an attempt to defeat Temüjin. They failed. Toghrul died in 1203 (killed by soldiers of the Naiman clan), and Jamukha was handed over by members of his own clan to Temüjin in 1206. Seeing Temüjin's inevitable victory, the conspirators were hoping to reap a reward by delivering his enemy to him. Instead, he had them executed viewing betrayal as one of the most grievous of offenses, not to mention that Jamukha had been Temüjin's anda. In fact, he offered Jamukha a chance at reconciliation. Jamukha refused saying there could be only "one sun in the sky." All he asked for was a noble death, which Temüjin granted (a noble death in Mongolian society was one in which no blood was shed. So his back was broken). Now Temüjin was the Great Khan (the first) and ruled over all the Mongolian tribes. It was time to turn outward. The nearest neighbor was China. In Genghis Khan's time, China was divided into three separate kingdoms; the Jin, the Song and the Western Xia. 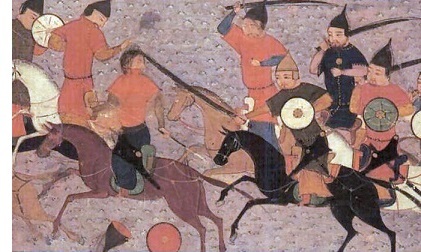 The Western Xia bordered Mongolia and was Khan's first target. It was also the weakest of the three. Genghis Khan invaded in 1209. The Xia emperor appealed to the Jin emperor for help, but Khan had correctly guessed that the Jin would stay out of the conflict. He conquered Western Xia in 1210 and made it a vassal state. In 1211 he turned to the Jin. The Jin kingdom was larger and more powerful than the Western Xia, and its Emperor Weishaowang believed he was safe from Mongol expansion. Had attacked Khan right after his conquest of the Western Xia, his chances of beating the Mongols would have been very good. Instead he allowed Khan to regroup and invade Jin territory. Even so, the emperor was confident he could repel the far smaller Mongol army. He was able to raise 500,000 troops including 150,000 cavalry (which was larger than Khan's entire army of about 100,000). The Battle, known as Badger Mouth, took place in late summer (or possibly early autumn). With the Jin holding a superior advantage and guarding the mountain pass, it was supremely confident of victory. But great military commanders come up with ways of winning in the face of overwhelming odds. Khan sent half his army on a trek over the mountains, around the pass and behind the Jin camp. While half his army attacked from the front, the other half attacked from the rear, completely taking the Jin by surprise. The rear half also managed to cut the Jin's supply lines, quickly depriving the massive army of food and materials. The Jin army panicked and was slaughtered virtually to a man. Four years later, Khan captured the capital of Beijing, and that was the end of the Jin Dynasty. The third Chinese kingdom, the Song was even more powerful than the Jin and too far removed for Genghis Khan to attack (it was left to his grandson, Kublai Khan to conquer). So he turned west and focused on the empires of Central and Western Asia. The nearest kingdom was the Kara-Khitan Khanate (it was a nomadic sinicized kingdom consisting of Mongol, Turkic and Chinese peoples. Central Asia has few natural borders, so a mixing of races was not uncommon). It was conquered in 1218. The Mongol Empire now extended as far west as Lake Balkhash. To the west of that was the much larger and far more formidable Khwarezmian Empire, ruled by Shah Ala ad Din Muhammad. But Khan was more interested in establishing trade relations than conquering it (initially). He sent a large caravan train along the Silk Road into the Muslim kingdom. When it reached the city of Otrar, however, it was intercepted by the region's governor, Inalchuq (Shah Muhammad's uncle). He imprisoned the members of the caravan and stole its goods, claiming it contained spies sent to infiltrate the Khwarezmian Empire. The fact that Genghis Khan sent three ambassadors (instead of soldiers) to the Shah to smooth over the incident suggests that Inalchuq may have been right. Rather than welcome the diplomats, though, the shah had two of them shaved (a humiliation) and the third (a Muslim) beheaded. This action infuriated Khan and he prepared for an invasion. An army of 200,000 men was raised in 1219 and divided into three groups. The first was led by Khan's eldest son, Jochi, and was ordered to attack from the northeast. 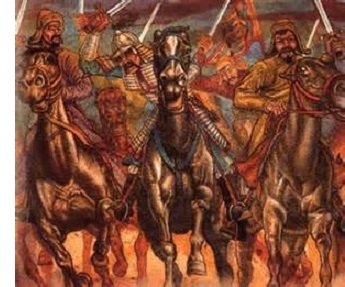 The second was led by Khan's general, Jebe, and ordered to attack from the southeast. The tactic was to strike the capital of Samarkand using a pincer movement. While the first two groups assaulted the capital, Khan himself would march around the northern border, turn south and attack from the northwest. Shah Muhammad, for his part, split his army into small garrisons and stationed them in his cities in order to protect them. It was a foolish move. Although the Mongol army was tired from the long march, it overwhelmed these smaller garrisons. The city of Otrar was of particular interest to the Mongols as it is where the caravan was seized. After a five month siege, its walls were breached and the city fell. Governor Inalchuq was executed by having molten silver poured in his eyes and ears. As his cities fell one by one, Shah Muhammad fled. The Mongols chased him, but he died on an island in the Caspian Sea before he was caught. Genghis Khan decided to make an example of the Khwarezmian kingdom for how he felt he had been disrespected by the Shah (and perhaps because the Shah died before Khan could torture him) and utterly destroyed the empire. Cities were burned and looted, artifacts were destroyed, and its people were subjected to wholesale slaughter (except the few who were considered worthy enough to be enslaved). Genghis Khan reportedly had the heads of the slain erected into pyramids as a monument to his victory. The conquest was completed in less than two years. On the march back home, Khan divided his force into two armies; one took a northern route and conquered Georgia, Crimea, and much of, what is today, southern Russia. The other took a southern route and added Afghanistan and the region just north of the Indian Subcontinent to the empire. However, along the way, the Mongol army suffered one significant defeat at the hands of the Volga Bulgars (ancestors of Bulgarians) at the Battle of Samara Bend in 1223. It would be the only known Mongol defeat against a foreign enemy in Genghis Khan's lifetime (although Khan himself did not fight in that battle as he was leading the southern army). The Mongol Empire now stretched from the Pacific Ocean in the East all the way to the Caspian Sea in the West. After a 21-year reign of a united Mongol kingdom, Genghis Khan died in 1227. He was succeeded by his third son, Ögedei Khan. Even in death, Temüjin was not done taking casualties. The legend of his burial states that a river (possibly the Onon) was diverted and Khan buried beneath it so his resting place could not be disturbed. Along the way, any witnesses were killed in order to prevent them from seeing the burial site. Then the pall bearers were killed so they could not reveal it to anyone. Finally, those who killed the pall bearers were themselves killed insuring Genghis Khan's grave site would remain a mystery.